Front row from left: Brenna McIntyre, Abreanne Andlinger and Amanda Palmer. Back row from left: Jenni Whitfield, Ben Keim and Colerain McCardle. 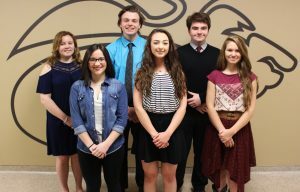 Six members of the John Marshall High School Class of 2018 have been named AP Scholars by the College Board. Monarch seniors Abreanne Andlinger, Ben Keim, Colerain McCardle, Brenna McIntyre, Amanda Palmer and Jenni Whitfield are being recognized for their outstanding college-level achievement through their performance on AP Exams. The Advanced Placement program, sponsored by the College Board, offers college-level classes to academically-able high school students. If an AP student passes the course test at the end of the school year, college credit is earned. To be named an AP Scholar, the student must pass at least three AP tests before 12th grade. McCardle has earned the AP Scholar with Distinction title for passing five AP tests prior to his senior year.